WatchTime New York: The Largest Public Watch Collector Show in U.S.
WatchTime New York: The Largest Public Watch Collector Show in the U.S. In four short years WatchTime New York has gone from an entertaining gathering for enthusiasts to a serious player in the watch collecting community. 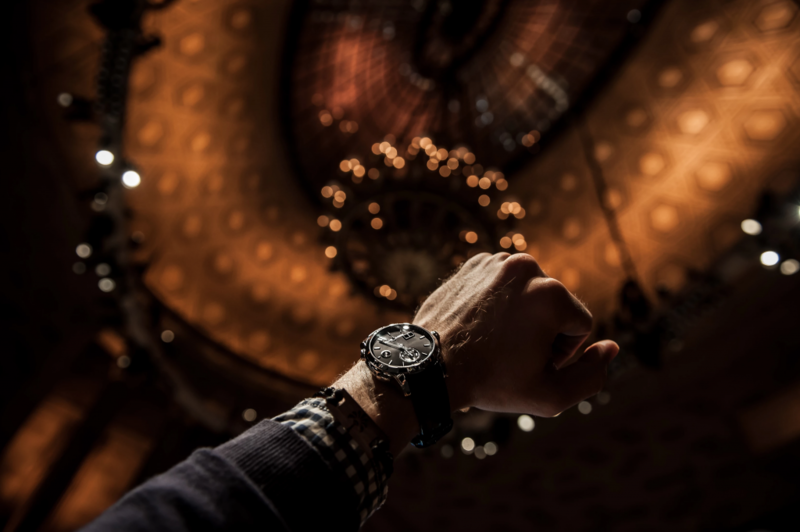 Billed as the only high horology show in America solely dedicated to the collector and enthusiast, WatchTime New York’s fourth edition at New York City’s Gotham Hall on Oct. 26–27 will see 30 watch brands present or debut their latest designs. In addition to exhibits the two-day program includes talks, cocktail parties and other events where collectors can share their passion. The brands aren’t all obscure watchmakers either – the roster includes everything from Omega, Jaeger-LeCoultre and Breguet to Bell & Ross, Bovet and MB&F. As part of the exclusive debuts at this year’s show, acclaimed engineer and watch designer Romain Gauthier will present his Romain Gauthier Insight Micro-Rotor Natural Titanium timepiece, which features a bidirectional 22-karat gold micro-rotor from both the front and back. Swiss watch manufacturer Jaquet Droz will also present its first-ever skeletonized timepiece, the Jaquet Droz Grande Seconde Skelet-One. Other highlights include Bremont’s new blacked-out U-2/51-JET watch, worn by Tom Hardy the Marvel anti-hero flick Venom; De Bethune’s DB25 Starry Varius, a highly coveted astronomical timepiece whose gilded Milky Way constellation dial “may be oriented and customized to the collector’s exact location, even down to the day and time of choice”; Maison Bovet equally celestially inspired Récital 22 “Grand Récital”, featuring a three-dimensional view of Earth from above; and Glashütte Original’s newest version of the Senator Cosmopolite with its impressive 36-time-zone display. Montblanc will also exhibit a limited-edition, green-dialed version of the Montblanc 1858 Monopusher Chronograph, part of their best collection in years in our opinion. The newly revived Czapek & Cie, which once made watches the the likes of Napoleon III, will also debut its first-ever chronograph, the Faubourg de Cracovie Dioné & Rhea at WatchTime New York. Finally attendees will also encounter avant-garde watchmaker Fiona Krüger, known for her super-cool skull-shaped timepieces.